Home Features What is Cyclocross? The sport of cyclocross is not a new one, but it is a niche within the cycling community. Its races consist of hundreds of bikers jumping on and off their bikes, going over obstacles and typically ending up covered in mud or grass. 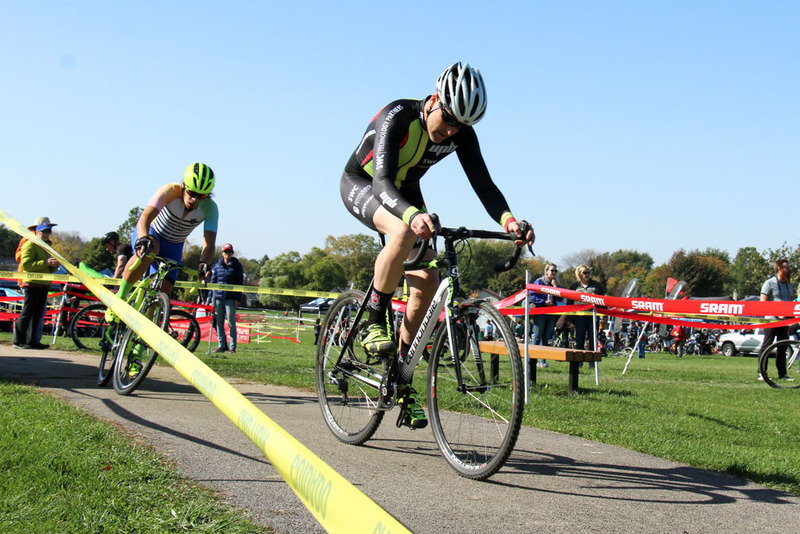 It may appear intimidating at first, but after learning the ins and outs, cyclocross is a unique and exciting sport all endurance athletes should try. The origins of cyclocross are murky—some argue it’s French, others say Belgian, and some say it was simply off-season training for roadies. Others even attest it emerged from the tradition of steeplechase racing. What we do know is it’s a discipline of racing at least as old as the Tour de France, and there have been national championships in the books for just as long. Despite its Franco-Benelux beginnings, the sport has come a long way and cyclocross (or CX) has grown immensely in the U.S. over the past 10 years. Chicago is home to one of the longest running and largest amateur series in the country, the Chicago Cross Cup (CCC). The CCC began in 2004, and has been gaining in notoriety and size ever since. In 2017, the CCC hosted eleven races, with around 700 people racing at each event. Just like other disciplines of racing, CX is broken up by categories; in each of the eleven CCC races, you have the option to race by your USAC license category (1-5) or by your age group (Juniors through Masters), and by women’s and men’s fields (women are allowed to race both). Overall, there are 14 racing categories built into the CCC race day schedule. Kids as young as nine are able to race the full course—for the younger crew there’s even an ‘unofficial’ race with a bevy of toddlers on trikes and striders—and the CCC regularly sees people in their 70s zipping by in the Masters fields (including National Championship podium regular, and Evanston resident, Graciela Viale-Val). CX is most easily described as a hybrid sport between road and mountain biking. The bikes have drop handlebars, but knobby tires; the courses are a mixture of off-road, mud, sand, pavement, and obstacles that require running (barriers, stairs, logs). Domestically, the season runs from early September to December, though the UCI World Championships closes out the professional season in February. The CCC hosts approximately one race a weekend starting with September and concluding in December with the State Championships at Montrose Harbour. Most participants view CX as the easiest access point to bike racing of all types. You can buy a one-day license, show up on pretty much any type of bike you own (as long as the tires have some grip), and essentially go your own pace in a large beginner field. It’s fun, it’s challenging, and if you’re out for blood you can redline for your whole race … and if you’re not, you have ample opportunity to take candy (or beer) handups. Though CX courses vary greatly by location and on account of weather conditions, there are some non-negotiables to each event. A USAC-sanctioned CX race will be between 2.5-3.5 km in length, and each race length is determined by time, not distance. The shortest races clock in around 20 minutes, and the longest at an hour. The number of laps that you in any given race is determined by the speed of the leaders on the first lap of each category. In general, laps are generally around six to nine minutes, though off-road, the vast majority of each lap will be rideable on the bike. However, there are short sections that require running. The Chicago CX community tends to be incredibly welcoming and friendly, and hosts a number of open-join, weekly practices—MOX, BFF Bikes, and Comrade Cycles each host one in the city, and StayRad Adventure Team tends to have a rad turnout in the burbs. The easiest way to find out about dates, times, locations is to look up any of these groups on Facebook or reach out directly. Practices are a great way to get your proverbial knobbies wet. Most of the practices focus on key skills required for the races (starts, barrier techniques, passing, cornering, skillz drillz, shouldering, running, etc. ), and provide a ton of community support and training information. All are welcoming to kids, women, seasoned racers and total newbies. And speaking of … if there’s one thing the Chicago CX scene is notable for it’s the community’s support of junior racers. The Pony Shop runs a phenomenally large junior’s squad out of the North Shore, and both Blackstone Bicycle Works and West Town Bikes field impressive junior CX teams on the South and West sides, respectively. There are also kid-specific clinics run annually by UPB Cycling (if you want to stay local) and at the Trek Cyclocross Cup in Waterloo, WI. All that’s left to do, is pick up a bike, head to a practice, and go ride some sand! Next articleBit by the Tri Bug: Now What? I believe that you are correct in stating that the Chicago Cross Cup is the largest but i is not the oldest. The Wsiconsin CX Series started in 1996.